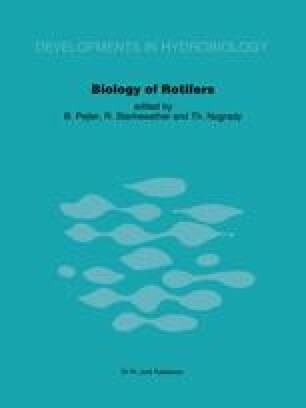 For the most part, rotifer behavior consists of simple, coded responses to external stimulation. Though these responses are readily observable, they have rarely been studied in detail. We are referring to responses such as the retraction of the head of the animal into the trunk following mechanical or chemical contact or the jumps of Polyarthra elicited by the same stimuli. Certain movements such as the typical cases of positive photo-taxis also belong to this category.